A few months back two very dear friends of mine James and Tracey asked me to build something special for their wedding day. 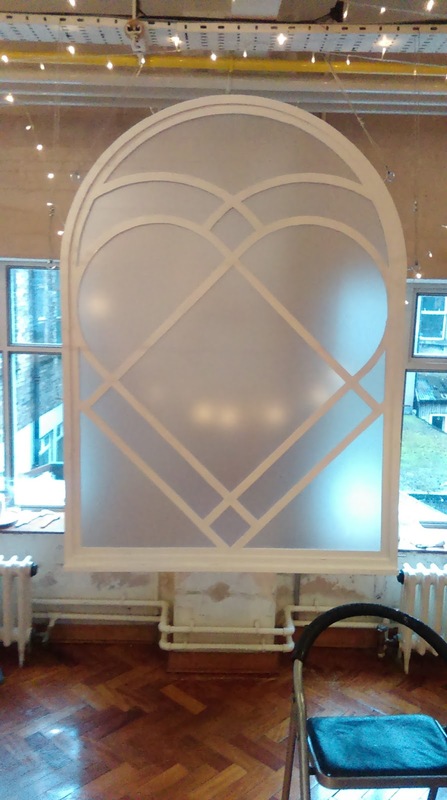 They wanted a backdrop for their ceremony and I was very honoured that they would ask me to build it. Early in the process they invited me along to view their newly found venue with them. 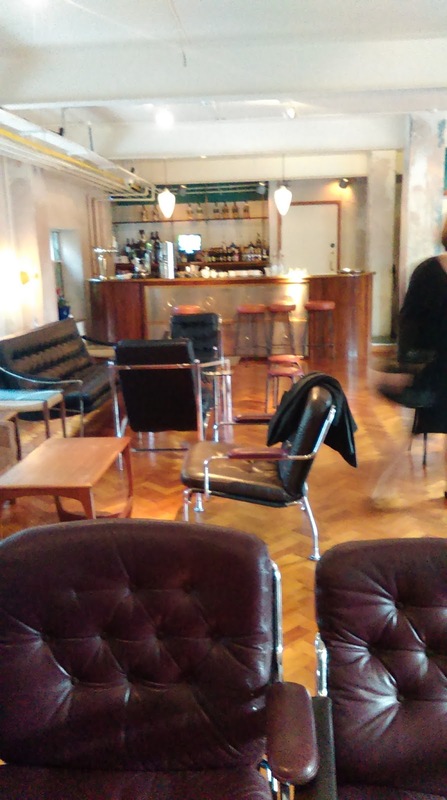 The venue, Drury Buildings in Dublin, is a new-ish bar/restaurant/venue in the centre of Dublin just off Georges's st. 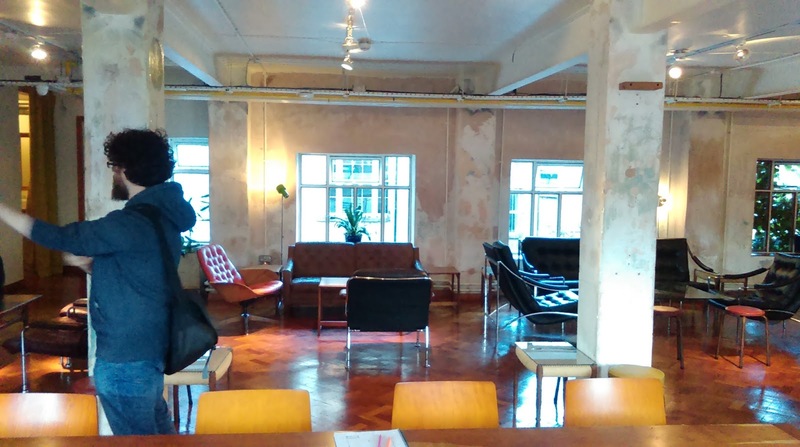 This area has recently been marketed as the "creative quarter" of the city and this venue certainly had a lot of creative design flair in their interior. The bar and restaurant below were tasteful and classy without being too ostentatious and the venue above had a very relaxed vibe with mid-century modernist furnishings, parquet flooring and a mild post-industrial finish with rough plaster walls and exposed services. After my visit here with the betrothed couple I took a little time to take in the setting, what I knew of the couple and think about something that could represent them and also fit in with the ambiance the room would create and the occasion. I returned to the area a few days later to take a walk around. 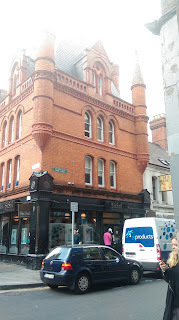 I took the photo below that day and the building is the corner of the old South City Market building that forms the block from George's St to Drury St. and is bound by Fade St. and Exchequer St on either side. It's prominent and beautiful redbrick façade and victorian ornamentation is an indelible part of the character of this area. This building just happened to also be the most prominent view out the windows of the wedding venue. 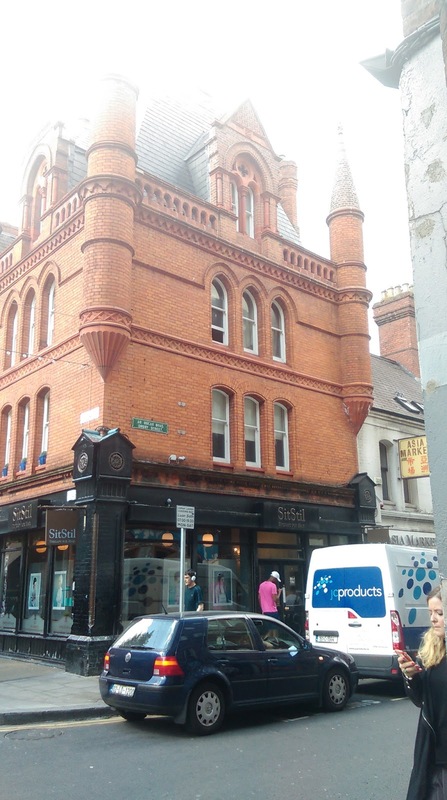 A lot of the architecture of this area has maintained historic detailing from the Central Hotel and Hogan Stand signage to the entirety of fade st's redbrick buildings and the grandiose stone work of the Powerscourt centre a short walk away. The white wooden sash windows of the market building opposite with their arched tops were the spark of local visual inspiration needed for the final piece. 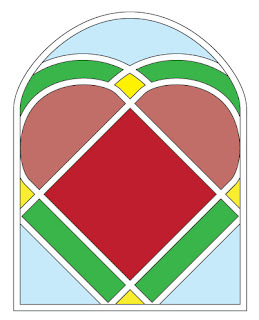 After mulling over the different elements of the setting, the couple, and the venue for a few days I sent them a sketch done in illustrator for a stained glass window as shown below. 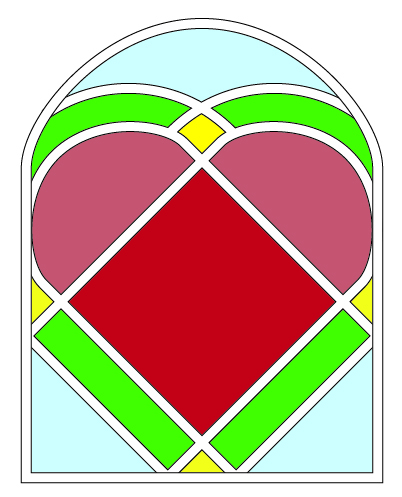 The general shape contains three window forms in it's construction with the main frame surrounding two overlapping angled windows that form a central heart. This central form was symbolic of the couple as two individuals coming together through their marriage. Their response was fantastic and their further suggestions were even better. It was they who suggested that as the wedding was happening in the autumn, nearly winter, months in Dublin a more subdued colouring could be better and landed on the idea of different levels of frosting. With that in mind and having discussed the dimensions of the final piece I produced the following 3D model and quick render for their consideration. The design was a go! 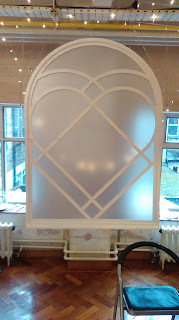 I'd like to say I began building the window almost immediately however having recently started a masters course, returning to seasonal lecturing work and a host of other things going on the build was mostly completed during the nights of the week leading up to the wedding. Having no workshop and limited tools I stuck some trestles in the weather safe, though slightly restrictive surrounds of my bathroom. A Sheet of plywood I had left over from a previous project would become the main substance of the window. This sheet being a standard 1220mm by 2440mm fit in the bathroom with about 40mm to spare either end. This made the whole thing a feat of mild acrobatics as much as a construction project. 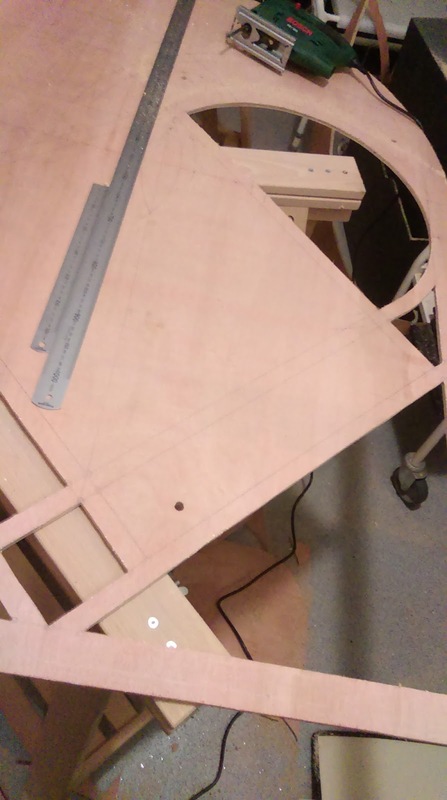 In the week leading up to the build I looked for a low cost solution to drawing the large curves of the window on the plywood sheet accurately. As very few presented themselves I made myself busy in any available downtime in college turning a piece of thin scrap pine into a large compass. I've wanted one of these things since tech graphics class in secondary school if I'm honest and had a lot of fun making it. 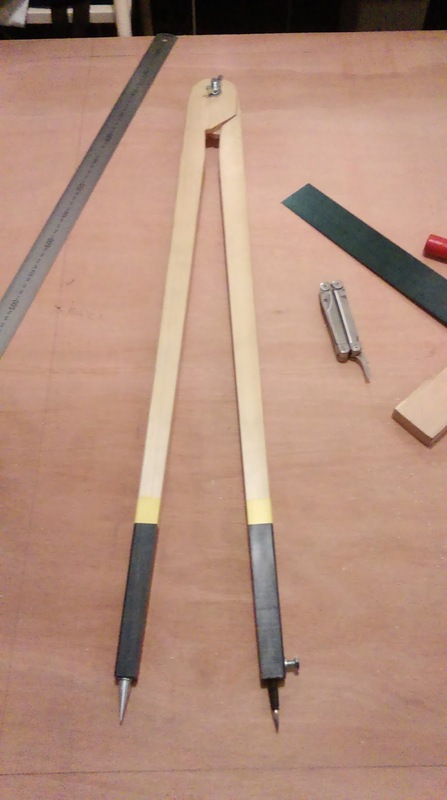 The final product can be seen below and performed perfectly and accurately on the night of marking out and cutting. The hardware at the top is a cut piece of m10 threaded bar, a domed nut, and a thumbscrew bolt for tightening. 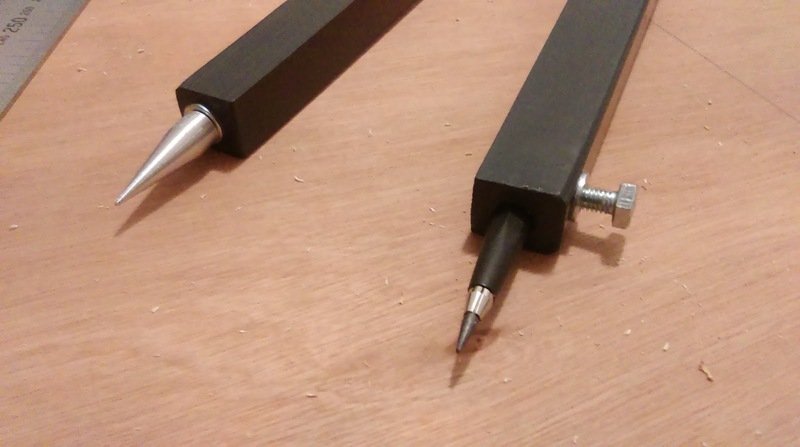 The aluminium tip was turned on a metal lathe and the mechanism for holding the drawing implement in place is a captive nut and m6 hex head bolt that protrudes into a 10mm diameter shaft. I might write a bit on this again in another post as it was a good exercise in fruitful frugality in the end costing a total of about 50c. This was mostly as it was made from scrap and leftover materials and spray paints from previous work. The final piece got a matt clearcoat spray coating for protection. In the photos that follow you can see the process of creating the central shape of the window. 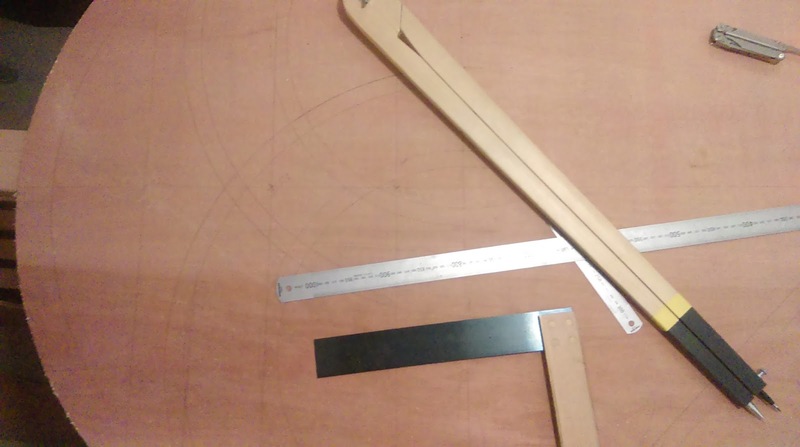 After marking out, each section had a pilot hole drilled in it and then section by section the form of the frame was removed using a jigsaw until the design was revealed. 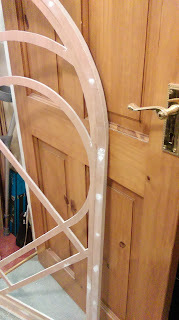 Before beginning this I had also trimmed a section off the side of the board and cut two curved sections from the top of the board which would bulk up the outer frame of the window. These pieces were offset out from the main frame shape outline to give the impression of depth to the window and to secure the glass at the back. 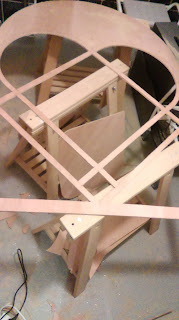 Once all the sections were cut out, the outer frame was attached using wood glue and 16mm screws. 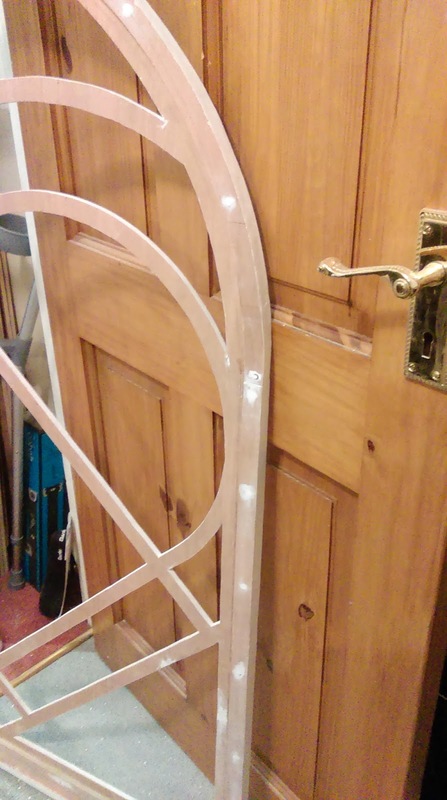 Below is the first test fitting of the glass which went reassuringly smoothly. Next up was a spot of finishing before the frame could be painted and glass installed. 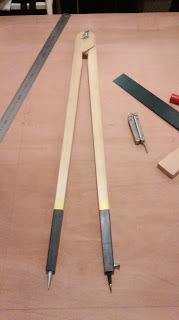 The screw heads, which were sunk into the surface of the wood, were primed and covered over with a lightweight wood filler I've used on other projects before that gave nice smooth results. 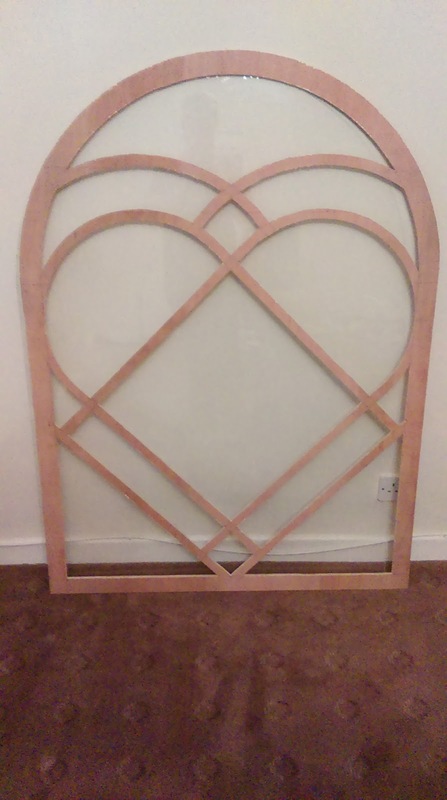 The lines of the design and outside of the frame were cleaned up using chisels before being thoroughly sanded to remove any burrs or rough edges and then any deviations or divots were also filled to be sanded later. Then came the frosting. I had never worked with this stuff before and though I had a conception of the difficulty of it, the reality was quite difficult indeed. 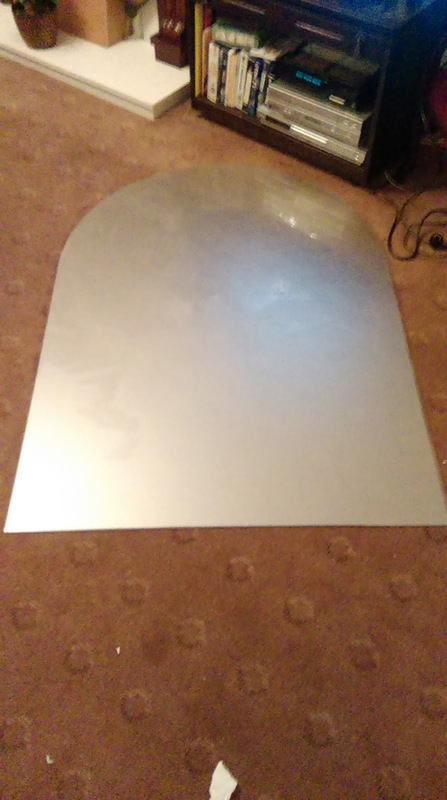 That being said I found a vinyl supplier called Gerry Monaghan Signs nearby my house in Coolock who really done me a solid and agreed to sell me a small quantity of frosting transfer for a very fair price. The guy in the workshop when I arrived, Martin also gave me loads of advice on how to apply the transfer correctly. Can't say enough how much hassle these guys saved me and how grateful I am. The below photo is of the first layer of frosting having just been applied to the window. I cut it roughly to shape, though a little oversized, and used the outside edge of the window to trim it properly once it was in place. The window was wet down with a soapy water mix in a spray bottle and once the backing sheet was removed from the transfer it was also wet down. This gave me a little play after the transfer was applied to the window. Although I cleaned the window thoroughly a very small piece of the backing, which tore a little as I was removing it is lodged behind the transfer, though it is a very small and barely noticeable aberration close to the outside of the frame. I was really pleased with the result of the transfer process and proceeded to begin the second layer of transfer over the heart outline. To get this right I used tracing paper to make templates of the areas to be covered from the frame. I then marked in light pencil on the frosted side of the glass where these piecer were to go by presenting it to the frame and marking through the gaps, being careful to ensure these lines fell under the areas that would be masked by the frame. 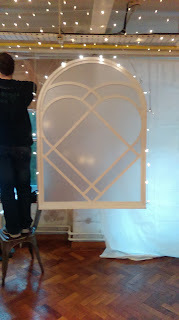 Unfortunately I don't have photos of this part of the process as this was done late on the night before the wedding, I was somewhat stressed as the paint from the night before had not fully dried and I'd just recovered from the (mild) stress of the first frosting process. 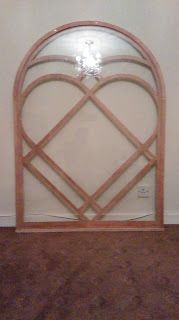 Finally I married the frosted glass to the frame using panel pins in the surround, flush to the back of the window. 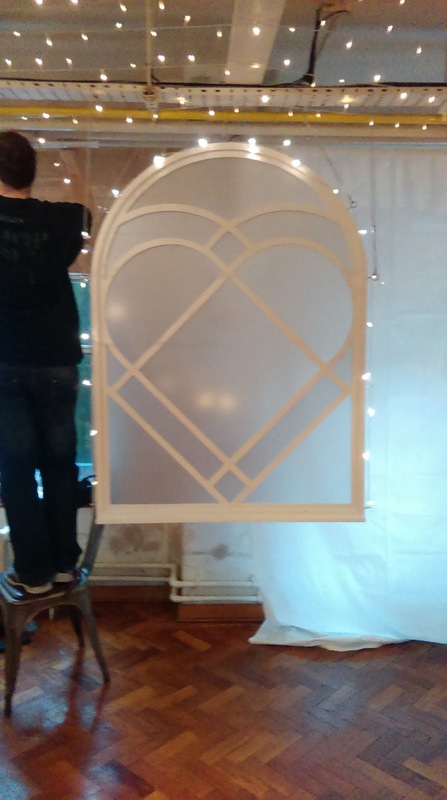 I had purchased putty and intended to also place some of this around the back of the window but due to the drying time of the putty being somewhere halfway through the afters of the ceremony I decided to simply double the number of panel pins securing the window for safety's sake. As you may have gathered the window is large measuring in at 1050mm x 1468mm, roughly a meter by a meter and a half (or 3' 4" by 5' for those of an imperial persuasion) so on the morning of the wedding (after about 5 hours sleep) I was getting some help loading the window into the back of the grooms car. We then headed off with a bag of tools and fixings to install my first window! The window was suspended from an existing services tray that had been noticed during the earlier visit mentioned above. 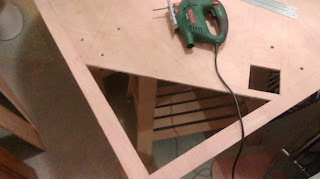 To accomplish this I attached four strong threaded steel eyelets to the top half of the window drilling pilot holes about 2-3mm smaller than the thread, to ensure a solid connection without fear of splitting, bulging or otherwise compromising the structure. The lower two eyelets were attached where the frame meets the inner design as I felt this would be stronger than an open section of frame. The window was suspended mostly from these two lower points with two other points, slightly less taught to act as a safety in case my over-engineering was under calculated at any point. The frame was suspended using braided steel cable secured with cable locks. I also bought curved channels to relieve point stresses where the cables wrapped around the services tray and the eyelets. Though providing to be challenging in a lot of respects this project was incredibly rewarding and satisfying. The "clients", my friends, James and Tracey we're really happy with the piece too and have said they plan to hang it in their first house together as an art piece and memento of the wonderful day they celebrated. I cannot think of a bigger compliment to receive than that and was absolutely delighted to be involved in part in what was a truly unforgettable occasion and such a heartfelt project to be gifted with. It really was amazing! 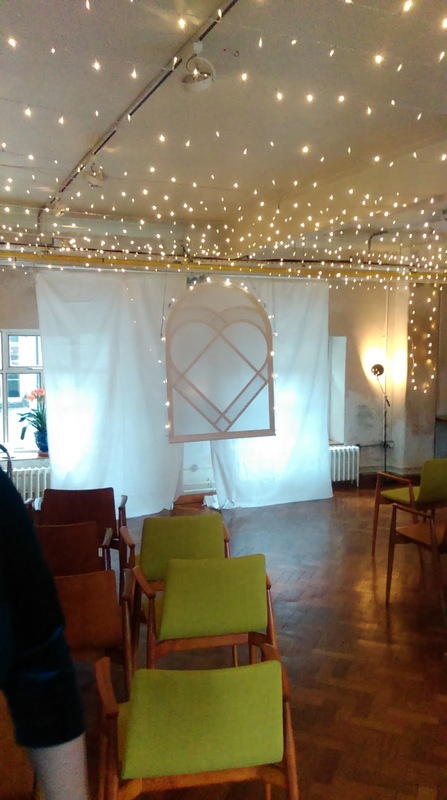 Brought the room and ceremony together! Great work John! !